1. Time for a new brew: Howard Schultz announced Monday he will step down from Starbucks (SBUX) later this month as executive chairman, the end of a 36-year run at the company. Schultz has overseen enormous growth at Starbucks. It has expanded from 11 stores in the early 1980s to more than 28,000 stores in 77 countries today, and a market value of $78 billion. 2. CEOs on the economy: The Business Roundtable, a powerful lobby that represents major corporations, will announce the results of its second quarter economic outlook survey on Tuesday. Its member companies employ more than 16 million people. The group's constituents will discuss how much they plan to invest in their own companies and how many people they plan to hire over the next six months. They'll also provide sales and GDP forecasts. 3. RBS sale: The UK government has sold part of its huge stake in the Royal Bank of Scotland (RBS), the lender it was forced to bail out during the global financial crisis. British taxpayers now own 62.4% in the bank, down from 70.1% before the overnight sale. The bank said in a statement the stake was sold for £2.5 billion ($3.3 billion), which is £2.1 billion ($2.8 billion) less than what the government paid for it in 2008. 4. Apple's new features: Shares in Apple (AAPL) closed 0.8% higher on Monday after the company announced a slew of new features at its annual developers conference. The company unveiled its next-generation mobile software iOS 12. The system is packed with performance improvements, quirky features and a tool to help combat tech addiction. Apple is now roughly $50 billion away from a market value of $1 trillion. European markets opened mostly higher, while stocks in Asia ended the trading session mixed. US crude futures added 0.7% to trade at $65.20 per barrel. 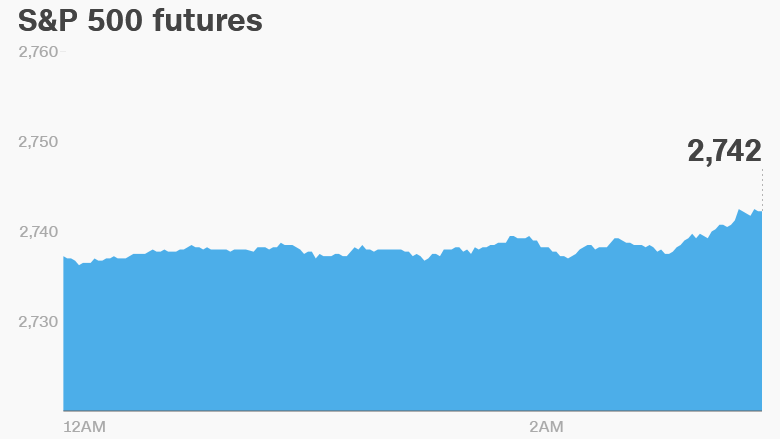 The Dow Jones industrial average and the Nasdaq both gained 0.7% on Monday, while the S&P 500 added 0.5%. 6. Earnings and economics: Societe Generale (SCGLF) will pay more than $860 million in fines for bribing Libyan officials and manipulating a benchmark lending rate, the US Department of Justice announced Monday. The Royal Bank of Australia left its benchmark interest rate on hold at 1.5% on Tuesday.